Pacific Northwest Ballet company members in Kent Stowell's "Swan Lake"
I’ve got an old Beatles’ song running through my head. Noelani Pantastico as Odette in "Swan Lake"
Pantastico starred in Saturday evening's performance of Pacific Northwest Ballet’s latest iteration of Kent Stowell’s “Swan Lake.” Even if you don’t know much about ballet, you probably know about this one. It’s the 19th century classic about a prince who falls in love with a woman, Odette. The problem? She’s actually under the spell of an evil sorcerer. Odette only takes human form at night; by day she’s a white swan. Only sworn true love can break this spell. Unfortunately for Odette, that doesn't happen. Her prince is seduced into pledging his troth to her evil doppelganger, the black swan Odile. Nobody lives happily after in this ballet, but it sure is beautiful. 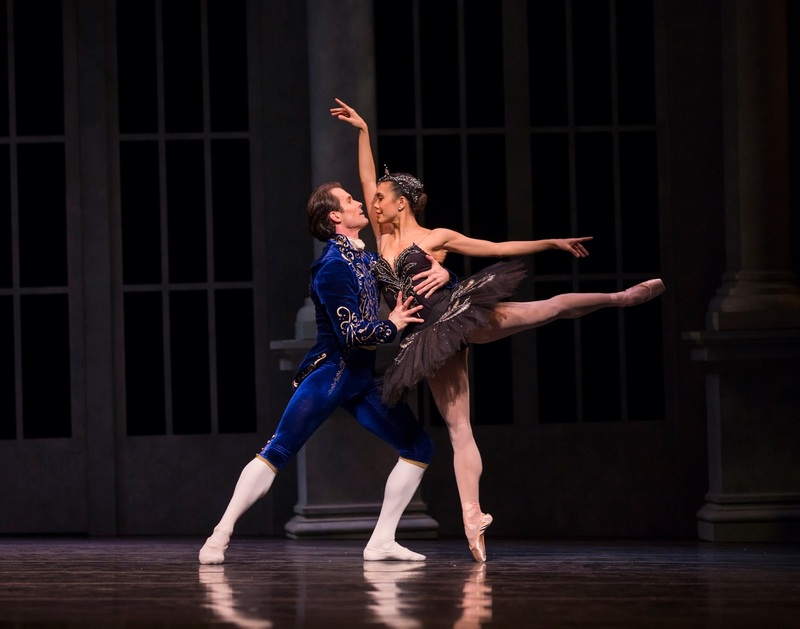 In most contemporary productions, the same ballerina performs the dual roles of Odette/Odile. It seems to me, a non-ballerina, this must be one of the most challenging roles a dancer faces. Technically, the ballerina has to leap and spin, and perform Odile’s notorious 32 fouette turns, whipping her body around and around. It requires not only a laser-like focus, but also incredible stamina. Maybe more important than technique, the ballerina must bring emotional depth and dramatic ability to these two roles. She must convince us that she is a graceful enchanted swan woman Odette, as well as the beautifully confident (but let's face it, venal) Odile, daughter of the evil sorcerer Rothbart. The last time I saw “Swan Lake,” the incredible Carla Korbes danced Odette/Odile. Korbes was (and maybe still is?) one of the most graceful and emotional of dancers. Her Odette was birdlike and bereft; her Odile? Well, Korbes was excellent but she wasn't really convincingly nasty. Still, she was my gold standard. Pantastico has years of experience at both PNB and with Jean Christophe Maillot's company, Les Ballets de Monte Carlo, where she honed her dramatic talents. Of course she leapt and spun, but she imbued both swans with something extra. When Pantastico is overtaken by dark magic and begins to transform from woman to swan, it seems to come as a shock to her body. Her long arms begin to flap, pulled at the shoulders, as if Rothbart is yanking invisible strings. Pantastico’s huge dark eyes mourn, her expression is one of agony as she is wrenched from Orza’s arms toward Rothbart, who looms in a misty corner. so in love, but not for long! As I said earlier, I’ve just seen a dancer, a performance, I can’t forget. Four other PNB principals will tackle this demanding role during the run of the production. Lesley Rausch and Laura Tisserand danced Odette/Odile opening weekend; Elizabeth Murphy and Sarah Orza will make their debuts this week. Each woman will bring her own interpretation, her own experience and technical skills to her performance. Each will be unique. I wish I had the time to see them all. Rausch and Sarah Orza are both dancing at the top of their games right now; Tisserand is just back from maternity leave, and Murphy will dance this role for the first time with Prince Lucien Postelwaite.